The term “retail apocalypse” refers to the perceived decline of brick and mortar retail in the United States due to the meteoric rise of eCommerce. While several iconic American retailers such as Sears and J.C. Penny have struggled mightily since the global financial crisis, overall evidence for the retail doomsday is mixed. It’s eye-opening, particularly when you consider that Amazon is worth more than Sears, Macy’s and Target combined. Furthermore, the decline in value for large retailers like Best Buy comes in a time of macroeconomic prosperity, leading many analysts to fear widespread retail carnage if the U.S. economy slows or enters a correction. In addition, malls across North America are closing at an alarming rate with well-regarded industry estimates suggesting that 1 in 4 U.S. malls will be closed by 2022. But does this signal the end for brick and mortar shopping as we know it or simply the decline of species least adaptable to change? One of the potential adverse ramifications of the retail apocalypse is the widespread loss of employment for hundreds of thousands of workers. There’s some legitimate concern here as department stores have shed 18x as many jobs as coal mines since 2001. But there is also rapid growth across several other facets of the retail sector, with tens of thousands of jobs being created by boutique stores and thriving discount outlets such as TJMaxx. Speaking of TJMaxx, the best place to buy a killer $15 bathing suit is a stubborn outlier for those calling for the death of retail. TJ Maxx conducts the vast majority of sales in retail stores, struggles mightily in digital, sells to middle-class consumers and is THRIVING. 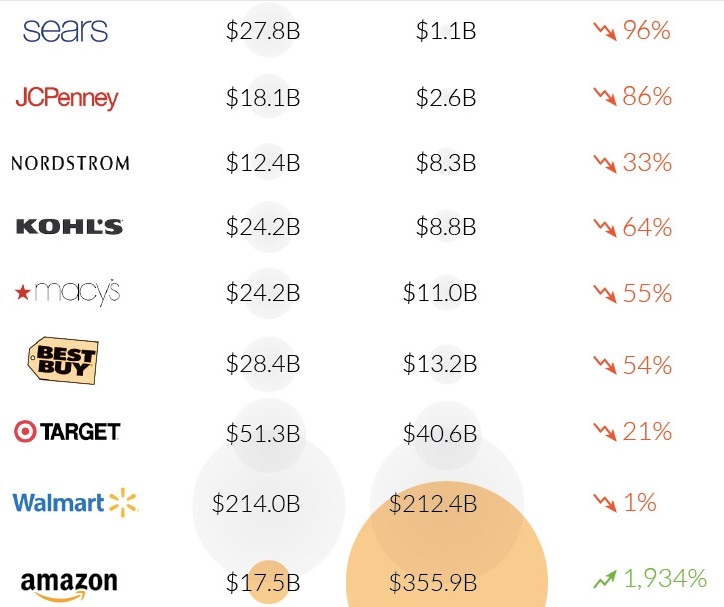 However, the greatest argument against the retail apocalypse comes from looking at the curious behavior of the world’s best eCommerce brands. The very outlets that “killed” brick and mortar retail are opening physical stores to expedite their growth and presence in the market. Digitally native brands such as Warby Parker, Casper and Harry’s are all investing heavily in physical storefronts and Amazon spent $4.5B to acquire physical delivery outposts dressed up as high-end grocery stores. Brick and mortar isn’t dying, it is simply emerging in a new likeness. 1) They manically focus on delighting their customers by crafting experiences: While Jeff Bezos has repeatedly stated that his goal is to make Amazon the planet’s most customer-centric company, there are several companies giving him a run for his money. Whether it is the curated treasure hunt that is TJMaxx or the couture experience that defines Rent the Runway, delivering an experience that makes a customer want to walk into a store is step one to remaining relevant. 2) They invest heavily in personalization: In an increasingly commoditized world where Amazon can deliver goods in less than an hour, personalization is the best way to build brand equity and win hearts and minds online. With personalization proven to reduce acquisition costs, increase the efficiency of marketing spend and lift revenues, it is key to creating a business that thrives both online and offline. 3) They change with the times: Brooks Brothers was founded in 1818, just 42 years after the United States was born. Today, they are one of the nation’s healthiest retailers, largely on the back of robust digital and mobile commerce. Fair to say, they probably don’t have too much of the original catalog still on sale.